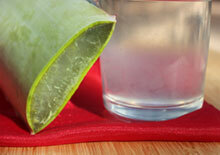 Top Reasons to Drink It Aloe vera gel and juice, for consumption purposes, is typically extracted from the Aloe barbadensis Miller subspecies of the main "true" Aloe vera plant. This is the most popular variety for dietary use because of its larger sized leaves and medicinal qualities. As a hardy succulent desert-growing plant, aloe has developed a specialized storage structure which enables it to efficiently hold water within its thick green skin. These features provide a moisturizing gelatinous fiber and juice that can have a health enhancing and healing influence when consumed as a dietary food.